Notes: Based on the manga by Koji Kumeta, currently running in Japan in Kodansha's Weekly Shonen Magazine. It's currently available in North America through Del Ray. This is the second season of Sayonara Zetsubou Sensei. The R2 DVD release contain enhanced/changed visuals and slightly different imagery than the broadcast versions of the episodes, as well as some visuals and images not in the original broadcast. The actual content itself is the same. Nozomu Itoshiki and his students go through another round of dark humor, satire, and in Nozomu's case, despair, in the sequel to Sayonara Zetsubou Sensei. It's hard to review this series without the reader in question having seen the previous season. Except for a humorous 7-minute "character introduction" segment in one episode, Zoku Sayonara Zetsbuou Sensei makes very little attempt to introduce those who didn't see the first season into the second. So if you haven't seen the first season yet, I suggest you do so before reading this review. Anyways, despite starting in a (very different) manner than the first season (even if it was all made up), Zoku Sayonara Zetsbuou Sensei provides more of the same. Which isn't a bad thing, since the first series' humor was so different and dark to be a fresh of breath air in comparison to all the cutesy high school comedies that have been coming down the pipeline recently. The problem is that it relies too much on offering more of the same. While I wasn't expecting character development or advancement in the plot, the archetypal characters start to show their repetitively for what is really is. Kafuka always contradicts a more depressed person's point of view. Chiri is always flipping out about something and using violence to express her views on how to deal with it. And Nozomu always goes into despair about something. There's not even any new characters except for Manami, a married high school student voiced by Kikuko "Belldandy" Inoue. And yes, SHAFT does make humorous stabs of Inoue's real-life comments on how she's "eternally 17 years old". Still, it does have new opening and closing themes (much better ones, in my opinion), and the material covered in this season is even more varied than last season. There's more reliance on parodies, but the characters and situations once again add to, not distract, from the spoofs and references. Like last season, the jokes aren't what make the show; it's the characters. Episodes are now divided into 3 mini-episodes, which leads to smaller segments and more switching back and forth between characters (which can get really confusing really fast). Zoku Sayonara Zetsubou Sensei definitely has some creative moments. One-third of episode 7 switches between various art styles, ranging from super-deformed shoujo (including a magical girl parody opening theme), to clay, to watercolor, to abstract art. Another episode has the various actors and actresses of the cast switching back and forth between other roles (including, yes, girls being voiced by men and vice versa). One episode references fellow SHAFT series Hidamari Sketch, whose airing they refer to as "a totally in-suspicious anime in the middle of the night", and another has two stories going on at once as they share the same screen and animation! 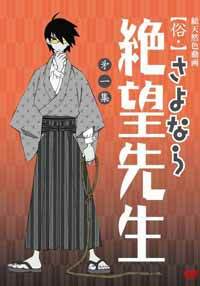 In short, if you liked season one, you'll no doubt love Zoku Sayonara Zetsbuou Sensei. If you didn't, you won't. That's about it. Recommended Audience: Some suggestive themes, fan service (mostly from Kaere), and the occasional bit of dark humor not suitable for little children. Okay for teenagers and up.